Over the years I have collected a bunch of GM service literature. I own GM 1967-1980, & 1983-1991 GM Light Truck schematics as well as 1973-1991 GM Light Truck and 1984-1987 D-series CUCV Parts manuals. I also own many of the 67-91 Unit-Repair/Overhaul, Service, and Emissions Driveability Manuals. TechRepublic Review of five-lightweight-and-free-pdf-viewers/ an important fact they left out is... Foxit is Ad supported so factor that in. Please Save these files on your local machine. Do not open in your web browser. The Mediafire PDF reader is not compatible with the Searchable PDF document type. The OCR text is visible along with the page image in the same space. It looks like Mediafire has begun compressing PDF files as .gz GZIP archives. You can un-compress it with a universal file archive tool. I use 7-ZIP because it opens darn near all archive formats, it's lightweight & fast, it's free, and so far it comes with no spyware or adware. http://www.7-zip.org. 1973-1991 GM Light Truck Service, "Unit Repair" or Overhaul, and Wiring Manuals. -The earlier service manuals are interesting. They're geared toward troubleshooting rather than changing parts. They have a lot of basic procedure and theory of operation information you don't normally find in aftermarket and modern OEM service manuals. -The Unit Repair and Overhaul manuals have in-depth GM re-build information on Axles, AC compressors, Hydro-Boost, Engines, Transmissions, and Transfer Cases. -68-86 GM wiring manuals are 11.5"x36" fold-out pages. My scanner has a max page length of 34". These manuals require that I scan from each end, save as 0 compression TIFF, and stitch where the diagrams aren't real busy in GIMP 2.8 64bit. -74, 75, 76 Medium & Heavy Duty service manuals are supplements to 1973 Medium & Heavy Duty Manuals. -78 & 79 Medium & Heavy Duty service manuals are supplements to 1977 Medium & Heavy Duty Manuals. -87-91 GM wiring manuals are A3 pages. I scanned these from cover to cover. -87 wiring diagrams have an odd layout. -81 & 82 8.5x11 GM wiring diagrams can be found in the back of the service manuals but these are a bit harder to follow as they don't carry the circuit from end to end on one page like the 11x36 pages. 1981 GM CK Light truck Wiring Manual Will scan and post if I can purchase or borrow one for scanning. 8.5x11 schematics are in the back of the service manual. GM STG 1992-1998_CK_Electro_Motor_Cruise_Control Used on the T400 chassis gas and DB2 diesel trucks. This is simple and self contained so it can be adapted to earlier vehicles. It's hosted with free access by Ian Harding. My scans of the 1973-1991 CK RV parts catalogs are searchable PDF files weighing in at 80-100 meg for each catalog set. The site is organized by printing date not coverage dates. This list should allow you to find which CK RV catalog you need to search. Note: you need both Parts and Illustration books to have a complete manual. Before you download these manuals. You will need more than a passing acquaintance with electronics repair and a bench of electronics tools. This does not mean a 40W Radio shack soldering iron and a precision screwdriver set. You will likely need at a minimum a good Benchtop DC power supply capable of at least 24v and 3A, VTVOM, Analog Volt Ohm Meter, Digital Volt Ohm Meter, Precision Temp Controlled Solder Station, and various hand tools... You may need a good Oscilloscope, frequency counter, and Audio signal generator. If you think I'm trying to scare you... I am. If you don't have all or most of the above tooling, lots of patience, and a fair amount of experience with electronics and your tools (you didn't just buy em)... farm it out to one of the many competent radio guys. You'll be many dollars, a bunch of frustration, and lots of time ahead. I have been searching for these as a complete un-butchered GM Radio manuals for a very long time. Be aware that most "complete radio manuals" on Fleabay are not anything of the sort. The Manual Mafia separate these into the internal chapters, label the chapters as a complete manual for whatever radio is on the first page, and sell them one chapter at a time for $30-$50 a chapter. They are cutting a rare reference book into chapters and spreading them to the four winds. What follows is an Excel 97 spreadsheet I put together several years ago to calculate the Speedo gears and engine RPM at various highway speeds. I was doing a "What-If" on transmissions, tires, and axle gear-sets and wanted to get transmission/transfer-case speedo gears as close to correct as possible. My 76 reads 1-2mph higher than actual speed. If my speedo reads 35 the local police dept's "Your speed is this" sign will read 33 or 34. For Speedo gears you only need to edit the Tire Size & Axle ratio. The speedo gear table will automagically calculate the ideal Driven and Drive gears. You then get to find which ones you can actually buy. You can edit the ratio adapter section to get you closer... If the gears you can actually buy are not close enough. For the RPM tables you'll need to edit the transmission and Transfer case gear ratios as well. There are tables of ratios found in common trannys and transfer cases in the RH pane. RPM_Gear_Axle_Transmission_TransferCase.zip archive with Excel 97 XLS format and Libre Office / Open Office ODS format. The Free Apache Open Office Suite https://www.openoffice.org/ and Free Libre Office Suite http://www.libreoffice.org/ 4.x and newer Office Suites "Calc" Spreadsheet applet will open and edit spreadsheets in Excel 97(XLS) & 2007 and newer (XLSX) formats. I lean toward Libre Office because the dev cycle for bugfixes and new features is shorter. Google Docs should open it on the web as well. .XLS files sometimes have visual formatting issues in Libre Office and .ODS files have formatting issues in some versions of Excel. They will both open in either office package but I included both for more appealing visual layout in the office package of your chioce. There are no Macros or VB Scripts. 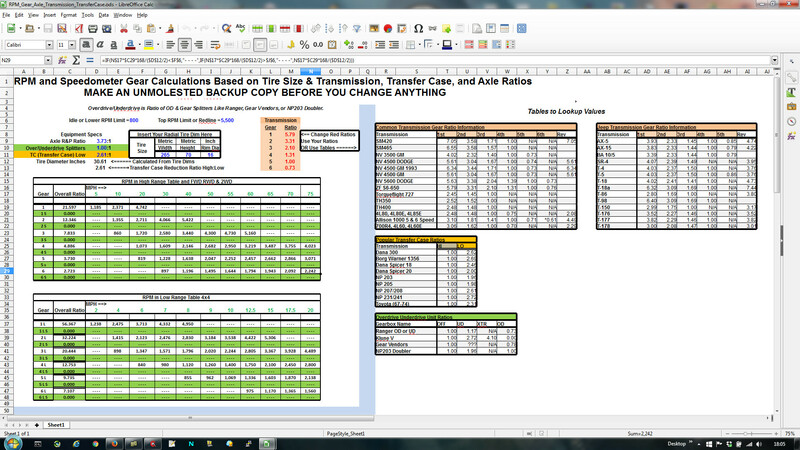 It's just a spreadsheet with some fairly complex formulas and color formatting. Thanks for taking the time and sharing them. Somebody archive or sticky this? Thanks for taking the time to scan and make them available. I have a 1983 Gm 10 bolt in my basement that I'm working on now, you just made my day. My hat is off to you, thanks. You have done a great service, one of the guys on the Jeep forum did that with all 3 CJ manuals, about 2500 pages THAT was a lot of work. I hate to know how many pages all these were. 2,500 service manual pages is a bunch of work. Service manuals are pretty difficult. The pages are thin and they're usually glue spine bound like paperback books that you need to get carefully cut off. I scanned @7,000 pages from all six 73-91 parts books and Ian Harding hosted them on gmpartswiki.com for us. They are posted by publishing date and not coverage date so... Thankfully they are all loose leaf 3 ring bound on heavy bond paper the sheetfeed scanner passed them through in several hours over 5 days. Several reasons to do this. The parts manuals are searchable PDF files now and I can bag the originals to keep them dry and stuff them in a metal box in the attic. Helm is no longer printing the wiring manuals and some of mine are getting a little yellow around the edges. Not brittle yet but that's the next step. Electronic copies backed up to the cloud in several places keeps them available to everyone and it'll be difficult to loose access to them via age and acts of god. This is pretty awesome thanks! Do you happen to know of a source that has pdfs of owners/drivers manuals for these years? Added 1991 RV P Schematics. GM got serious about troubleshooting with these. This manual actually includes harness routing diagrams and component locators along with troubleshooting tables. Word of the wise should be sufficient! I was just looking for a NP208 manual, because mine is leaking ATF and I wanted to see how hard is to take these babys apart...WOW, thanks for sharing! Thank you for sharing these! Adding them to my archives. I am a new member from an island east off Spain, starting my restoration of a 1970 c20 with a 350 in it. Does anyone know where can I download or get a pdf copy of a manual? Not to sound unappreciative, but thanks to you posting this wonderful information I have now aborted my plans to actually be on time for a deadline, and spend at least four hours glomming this stuff. Last edited by John Gilbert; 10-10-2012 at 11:35 AM. Reason: as usual, a typo. As I have done for many others, I have these posted along with tons of other documents over on my site just on the off chance the boards lose them or your account goes away. I'm adding content fairly regularly, but let me know if you need something and don't see it listed. I can directly link to the PDF files you copied to your site as Mirror-1 in the OP. Assuming it's OK to direct link to your site. My intention is to add at least one more mirror as time goes on. sure, no problem. I appreciate all the work involved..